MONTREAL, Canada - Sunday, with its dreary drizzle and grey skies, was hardly the day to be thinking about sitting out on one of the city's sidewalk terrasses. 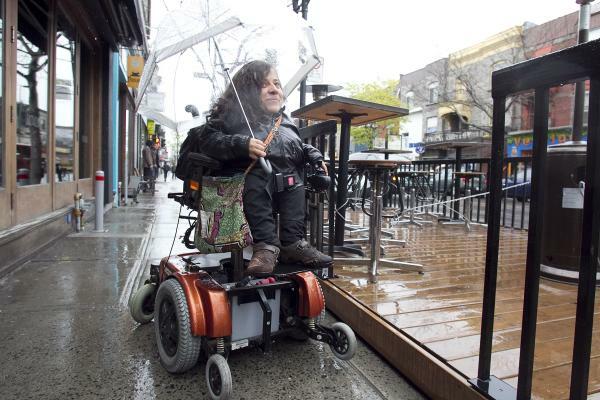 But a group representing people with disabilities in the city pulled out their umbrellas and headed along Mount Royal Ave. to raise awareness that in 2011, many outdoor patios at restaurants and bars lack wheelchair ramps. Projet Montréal city councillor Alex Norris said city specialists have told the party that there's simply not enough space to build a ramp to the terrasses - raised, fenced-in platforms jutting out from the sidewalk into a parking spot on the street. "It was our objective all along (to have accessible terrasses), but technical people say it's not possible," Norris said. He said the party has contacted the Quebec Human Rights Commission to try to arrange a meeting with civil servants, merchants and the Regroupement des activistes pour l'inclusion au Québec "to see if we can come up with a solution." Laurence Parent (pictured), a 25-year-old Montrealer and vice-president of the 200-member group, said Montreal is one of the most difficult cities in Canada to navigate in a wheelchair. Even the new elevators installed in some métro stations break down at least twice a week, forcing disabled riders to go farther out of their way to another station, then backtrack on a bus, she said. But the only time politicians seem to care about the accessibility issue is when those affected speak out about what is a guaranteed right, said Parent, who has been using a wheelchair most of her life. Vision Montreal, the official opposition, is to present a motion in city council Monday proposing that Montreal become the North American leader in accessible terrasses. "We find it a bit tiresome that the reasons always change for why things can't be accessible," Parent said. "We understand there's not space on the sidewalk (for a ramp), but there could be room on the side of the terrasse. "Instead, they install big potted plants, as if flowers are more important to them than people."